For the longest time now, I’ve wanted to build a real, proper radio telescope. To me, this means a large parabolic reflector, a feed horn made of brass sheet, coat hanger wire, and at least for the initial experiments, an RTL-SDR dongle. I’ve done the calculations, looked at old C-band antennas on Craigslist, and even designed a mount or two that would make pointing the dish possible. I’ve done enough planning to know the results wouldn’t be great. After months of work, the best I could ever hope for is a very low-resolution image of the galactic plane. If I get lucky, there might be a bright spot corresponding to Sagittarius A. There are better ways to build a radio telescope in your back yard, but the thought of having a gigantic parabolic dish out back, peering into the heavens, has stuck with me. I’ve even designed a dish that can be taken apart easily and transported because building your own dish is far cooler than buying a West Virginia state flower from a guy on Craigslist. Recently, I was asked to come up with a futuristic, space-ey prop for an upcoming video. My custom-built, easily transportable parabolic antenna immediately sprang to mind. The idea of a three-meter diameter parabolic dish was rejected for something a little more practical and a little less expensive, but I did go so far as to do a few more calculations, open up a CAD program, and start work on the actual design. As a test, I decided to 3D print a small model of this dish. In creating this model, I inadvertently created the perfect WiFi antenna for an ESP8266 module using nothing but 3D printed parts, a bit of epoxy, and duct tape. Let’s wind down the weekend with some projects that didn’t quite warrant their own feature, but we think they’re still worth a look. First up is a quick tip on cracking the lids on those hard to open jars of food. [Jason] says just grab about a foot of duct tape and the lid will come flying off. And while you’re searching for that roll of tape why not grab some foil tape to build a cooking oven. [Gabriel] built this solar oven by covering curved wedges of cardboard with foil tape and combining them to form a parabolic reflector. Next we’ve got a trio of hacks that will come in useful in your home shop or at the local Hackerspace. Organization is key, and here’s a resistor storage system that uses #6 envelopes [via Reddit]. Also useful is the tip from [Felix] about using a tile saw to get clean cuts on your circuit boards. 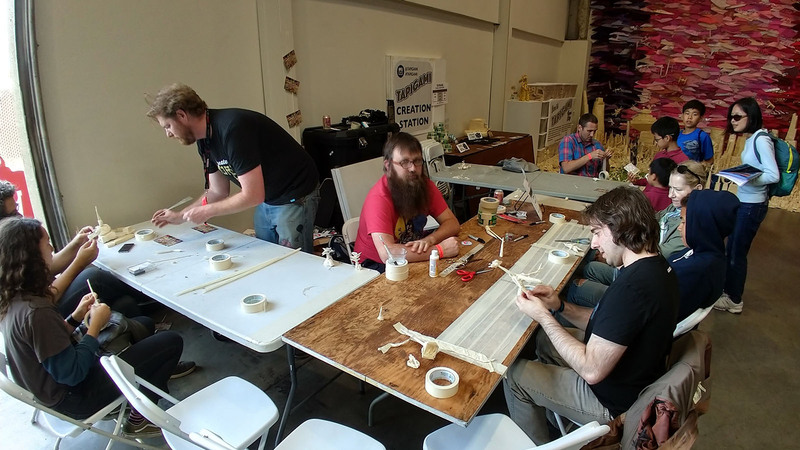 And if you’ve ever been plagued by a laser cutter job that doesn’t fully sever the material [Dan] wrote a guide on using a fence so that you can reposition the piece for another run. Finally, we’re hoping we weren’t the only ones that didn’t realize the Raspberry Pi has an unpopulated footprint for a reset button. Now we’ve got to figure out if it’s okay to leave the PSU plugged in (based on it’s current consumption while the RPi is in power down) and hack together some sort of TV-based reset circuit for our RPi XBMC setup. Looking to build your own instrument out of plumbing and tape? [Scott] made his own set of Membrane Bagpipes out of PVC pipes, a plastic bag, and duct tape. Bagpipes are made out of a few parts. The drones are pipes that are tuned to play a single note. They are tuned by the fixed length of the pipe. The chanter is a tube with finger holes. This lets you play various notes depending on which holes you cover. The blowpipe is used to fill the bag with air that will pass through the membranes on the drones and chanter. Finally, there’s the bag which stores air. [Scott]’s build uses PVC for the drones and chanter. The membranes are made out of cut up bits of plastic bags. Some crafty duct tape work makes up the bag, and seals it on to the various parts. A check valve is used to stop warm, duct tape flavoured air from blowing back into your mouth. It’s pretty amazing what people can do with a few rolls of duct tape. The pipes aren’t exactly in tune, but they certainly work. Check out a video of them in action after the break.